So! The first battle in our little campaign has been played! 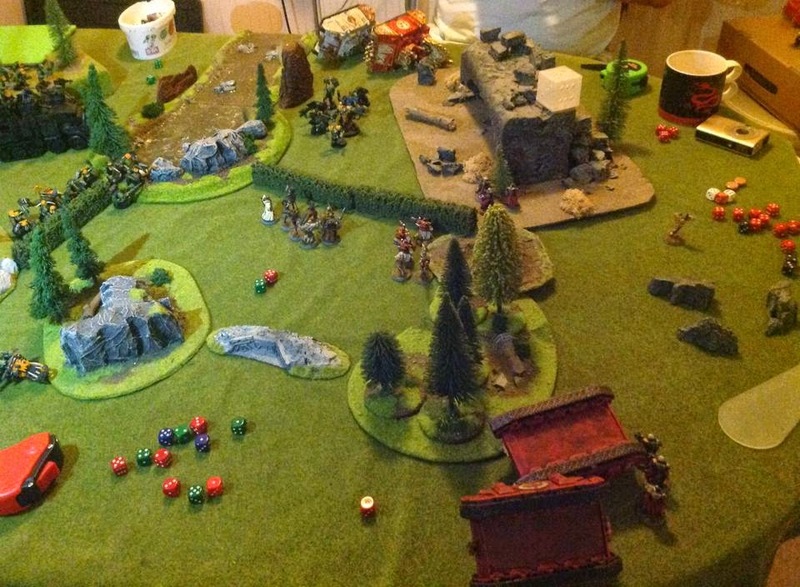 It was the Orks facing off against the Adepta Sororitas, and here is a quick run-down of the event as seen by our Eldar-player. One can only assume that his presence at the battle means there's some trickery in the making... perhaps he was the one who engineered the Orks to assault the peaceful nuns? Anyway, here are their lists before the battle. Note that the Orks have a larger army since they chose to spend their credits on units in the map part of the campaign! Orks elected to go first, thus placed first. 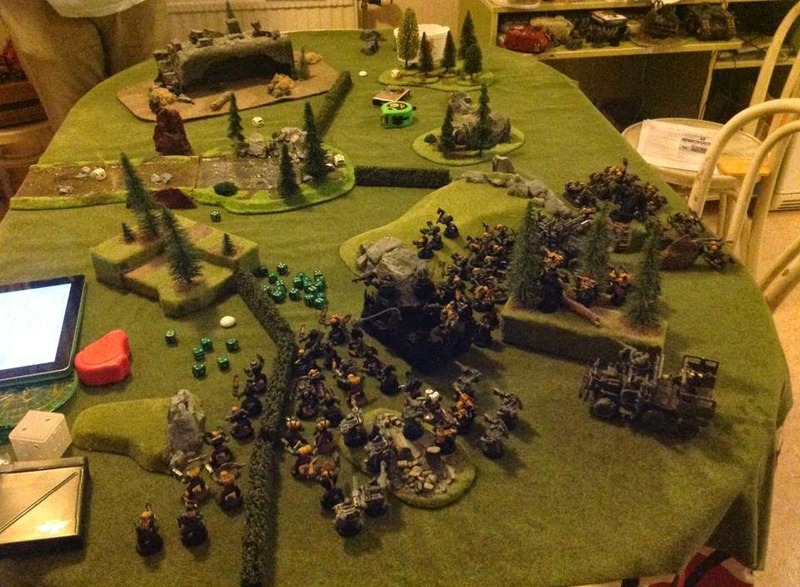 Orks deploy horde in centre, surrounding battle wagon. Bikers deploy right, fearing the terrain. 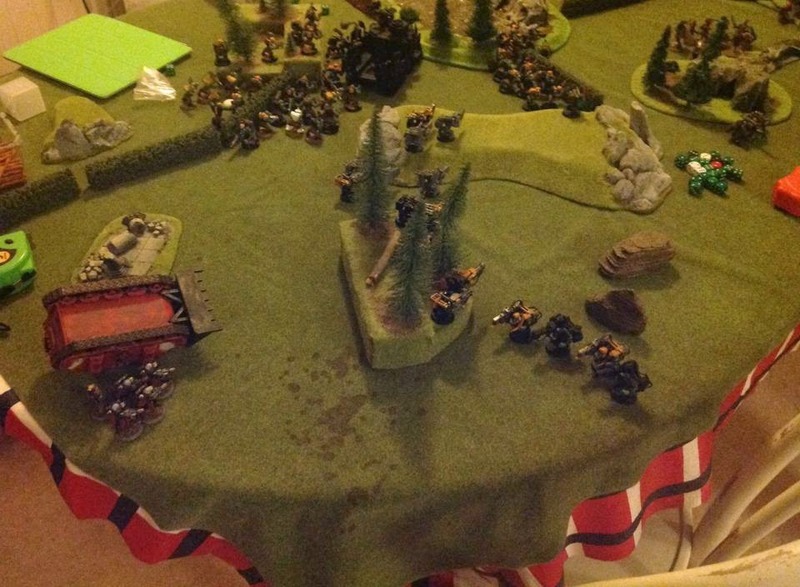 Sisters deploy exorcists on right flank, army to left in transports. Squad left in reserve. 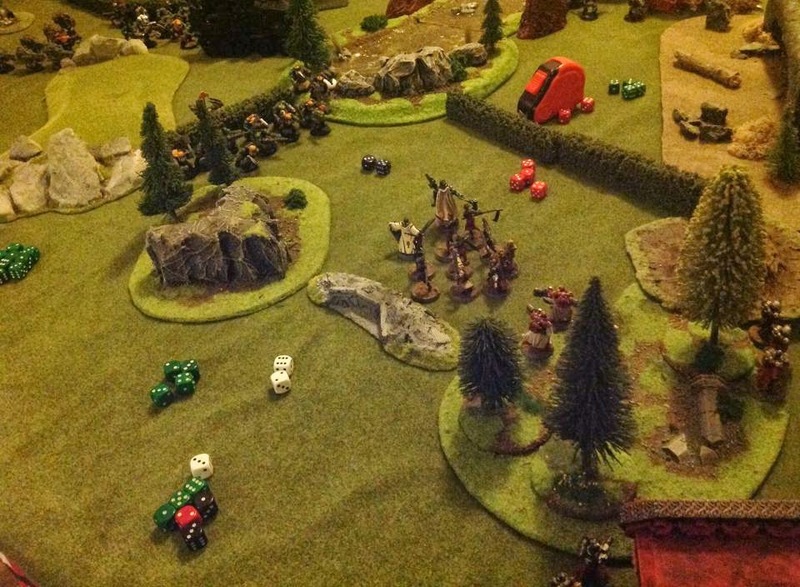 Remaining of orks run forward, with better or worse result on the dice, allowing the battle wagon and remaining trukk to flat out. Vortex scatters towards deployment edge, clearing the way for the exorcists to inch forward. Immolators move forward, two towards the bikers the third towards the horde. Exorcists shoot, one on a trukk and only manage a single penetration due to snap fire and the other only shoots a single missile on the wagon for no effect. 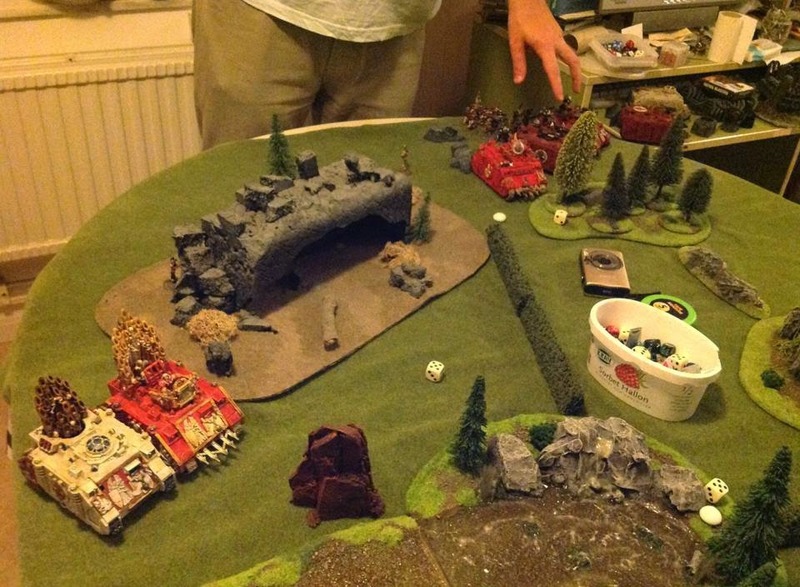 Immolators shoot multi-meltas on the bikers killing two (ork player forgetting jink rule). Vortex scatters 5" towards exorcist which therefore suffers a crew shaken. Dakka jet decides to arrive, but only after the reinforcement dice has been excavated from under the rear trukk. Bikes gather up for da waaagh, damaged trukk moves forward. Battle wagon manage to sink wheels in the river's mud and realizes he's well stuck. The walking boys move forward, pretending to be sheep jumping over a hedge, but the sisters remain awake. Dakkajet arrives to the middle of the table. Bikers score three lucky glances from their shooting on the flank-most immolator, none of which are saved by faith. The dakkajet however, was thoroughly denied by the emperor as the exorcist under the vortex managed two saves. The second melta-immolator denies a penetration but suffers another weapon destroyed hit that it could not save against. Lootas have a weak turn of shooting at the same immolator, which gain a cover save that subsequently fails on each of the damage results - wrecking the transport. Sisters spill out of the rear of downed transports while the rest of the horde moves forward at a brisk pace. The completely neutral observer notifies the orks that they are cowards for not assaulting the deathcult assassin. Assaults still happen to the flamer immolator. The tank suffers no less than two explodes results from a lightning klaw, killing two sisters and two boys in a display of poor luck for the Faithful. The vortex notices the melee and wants in on the action, scattering 9" towards the middle. 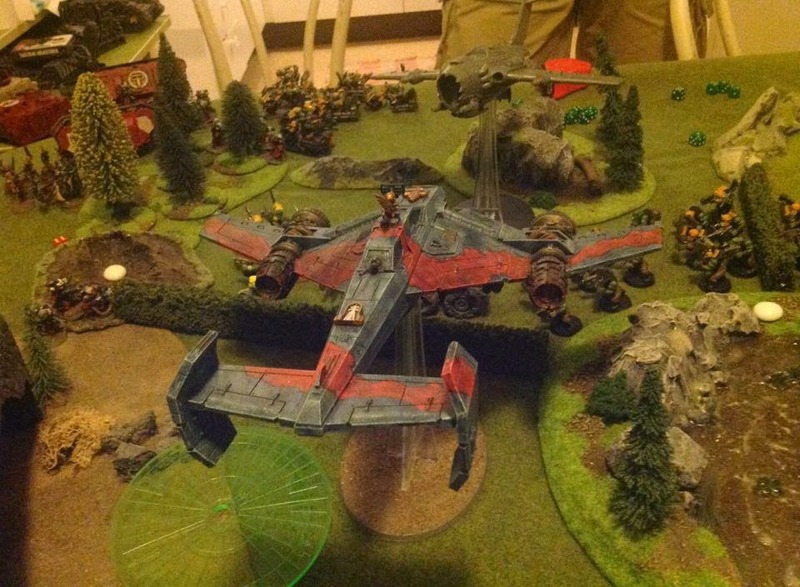 The avenger strike fighter arrives directly facing off with the dakkajet in the middle of the battlefield. The sisters estimate the effect of a heavy flamer, deciding their odds are poor, they move back. The exorcists realize they now have the opportunity to move. On the flank, sisters advance on the bikers over the corpses of their transports, managing to move unhindered. The Emperor's will be done. The henchmen moves forward, avoiding the wrecks, bringing priests closer. The avenger shoots, but neither lascannon scores hits and due to jink the missiles manage no effect in spite of several hits. The sisters in the middle heats the orks up, killing four boys and the nob! On the flank, bikers come under literal fire as well, bringing them down a single lonely boy. Going to the other flank, exorcist red shoots and hits as well as wounds with two missiles. Big mek takes a wound which deals instant death! Exorcist white considers options, eventually shooting 2 shots on the dakkajet which scores a single hit that gets ignored due to jinking. The rear squad brings multimeltas to bear on the same jet, but scores no requisite hits. Priests and henchmen runs through the woods. 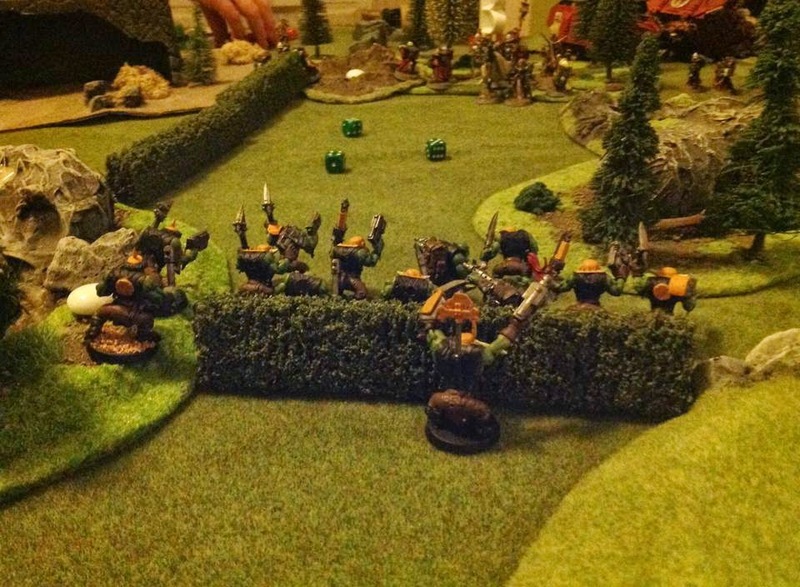 Orks in midfield fails morale, results in breaking 'eads. Due to no character, they flee instead of getting brought in line. Biker remains bloodthirsty. Vortex visits the midfield trukk, holding it in place and does a shaken result. Midfield boys rallies and moves a few inches. The damaged orc units moves back, trying to drag their fallen comrades to the closest Doc. Dakkajet adopts a more aggressive stance, threatening the white exorcist, while the horde advances forward, weaving between immobilised wagons and destroyed trukks. The remaining trukk shows the wagon how to traverse soggy terrain and moves into the river head. 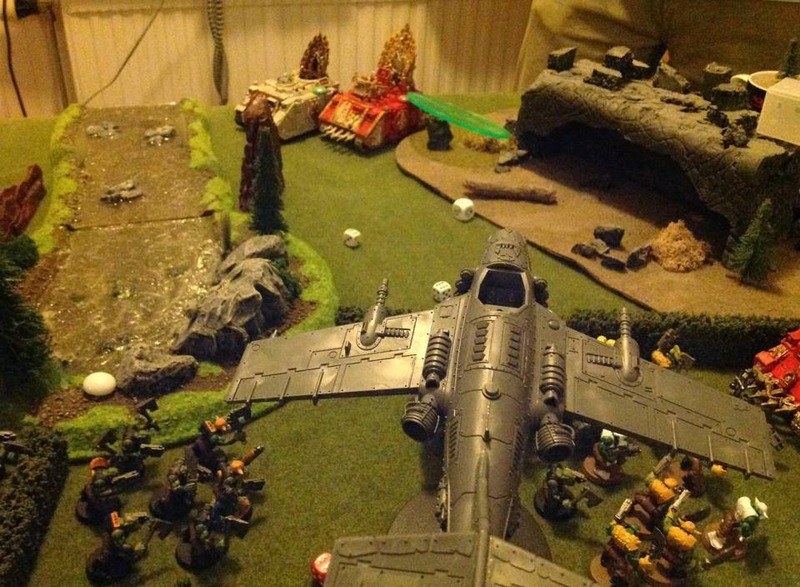 The dakkajet lands a lucky glance that the emperor deems unworthy of denying. The... Not-fleeing boys does their best to kill sisters, managing several wounds, killing two. Lootas gives their best, shooting on the avenger strike fighter, managing to bring it down with a penetrating hit and three glances. The remaining lootas shoot on the mostly intact squad near the immolators, hitting four, killing one. Vortex finally decides enough is enough and goes home for biscuits and tea. Minions arrive! They decide to arrive with their repressor right behind the lootas to the orks' rear. A battered squad of sisters flee, ending up in the way of the assassin, but rallies to a better position. Squads of sisters scramble for better firing resolution. Exorcists remain battered, but standing firm in the name of the holy Emperor. Repressor does not reach with flamer, but kills a loota with storm bolter. The squad inside shoots three meltas killing two meltas. The squads' combi-melta rolls snake eyes, killing herself outright. 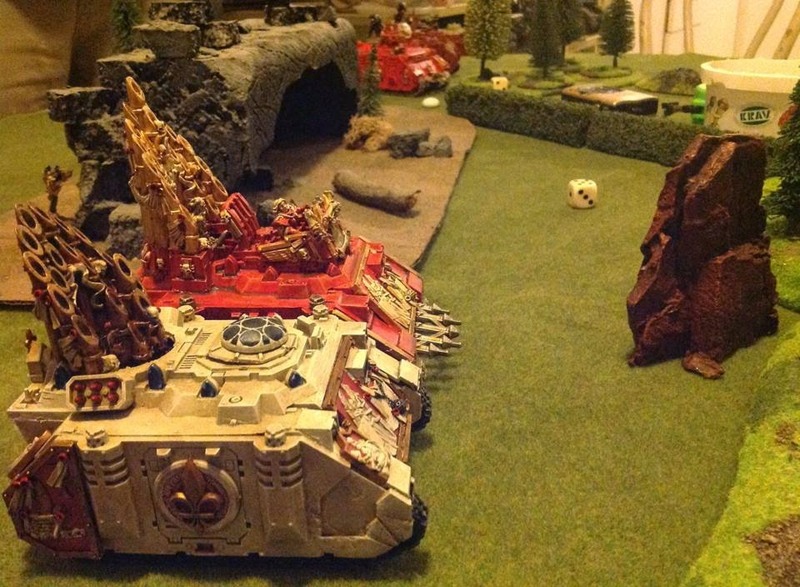 White exorcist shoots the side of the rear trukk, destroying it for nearly maximum effect - kills all but one tank busta and a further bunch of boys around it. The red exorcists takes notice, shooting the midfield trukk, destroying it and spreading death around it killing a further 6 boys! The flank sisters shoot at the retreating boys, slaying three (one still lives). Henchmen runs forward, moving out of the forest slightly. The center mob are forced to consider fleeing, coming under effect of Breaking 'eads, killing one boy (which cheers the others up, because no-one liked Billy-Bob). The flank boy decides this is not worth it and runs away, hoping to fight another day. Dakkajet moves to back zone, attempting to threaten the repressor. The mob in the wagon finally decide to disembark, moving into the bloodied waters towards the Emperors most holy exorcists, declaring WAAAAAAGH! One henchman dies from shoota fire. The lone tank bustah runs forward towards the red exorcist while the nobs makes a half-assed effort to get closer. The dakkajet manages three penetration against the repressor, but the emperor saves it from one of the damages, resulting in immobilised. The rear squad of boys fail at hitting with a big shoota. Battle wagon scores three hits on the same, but manage only one glancing. The Emperor wishes this repressor alive. Ground slogging lootas score three penetrations and one glancing hit, resulting in a wrecked transport. The sisters inside emerge battered by the experience, but alive and furious. Due to the threat of the remaining lootas, the sisters decide to hide behind the wreck. The remaining lootas shoot at the sister squad closest to the ork deployment zone, killing two while leaving two flamers alive. 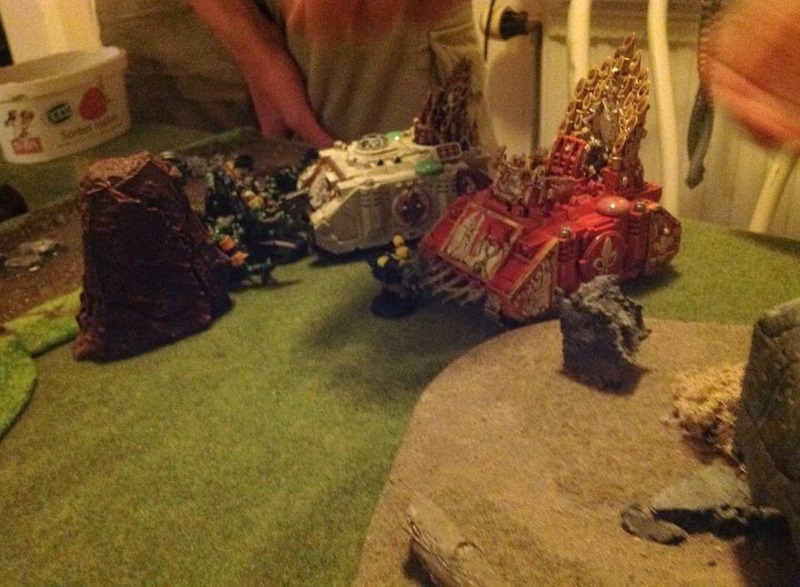 Nobs just barely manage to assault the white exorcist and the lone tank busta assaults the red exorcist. This is his time of glory. The bomb is good! He scoooores! The warboss pounds the white exorcist, landing four low ap penetrations, resulting in another wreck. Things are looking grim for the emperor's faithful. Henchmen and command squad move at high speed through the forest. The midfield sisters retreat. Outflanking sisters advance up to threaten the lootas. From shooting, the lootas enjoy protection of the forest, turning aside several melta wounds, losing only one boy. Henchmen move at brisk pace forward, remaining flank sisters retreat further, attempting to prevent losses. Command squad shoots at the centre boy mob, snap shots prevents hits. Observer notes, biker still alive! Biker moves to take cover behind terrain, close to henchmen squad. Nob mob moves forward. No time for cowardice. Dakkajet decides it will be unable to do anything decent and thus moves off the board. The groundslogging lootas move forward, trying to gain height advantage. Centre mob moves backwards, fearing the supposed assassin (seriously, it's just a skinny little girl in spandex!). Forest lootas line up to shoot at outflanking sisters. The tank busta and nob mob runs 3". The biker manages to exterminate two remaining sisters who had problems getting over the immolator. Centre mob shoots three wounds into the henchman squad, killing one crusader. Lootas on the hill follow suit, three shoot three each, scoring no wounds. 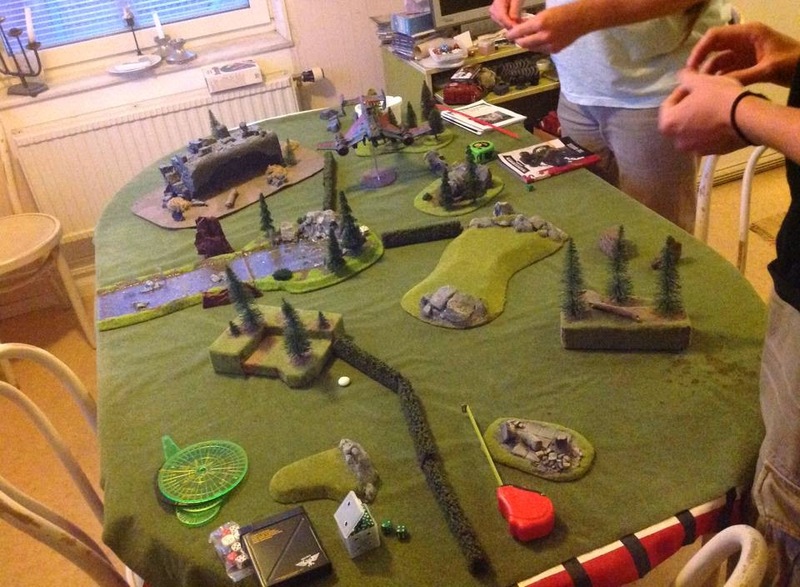 Forest lootas shoot at the outflanking sisters, hit five, wounds four, killing one. The battle wagon fails to hit henchmen. The remaining sister squads jousts for better cover, the assassin henchman squad moves towards the nob mob. One sister squad moves forward to flame the tank busta (killing it). Outflankers remain standing while command squad moves and run towards the nob mob. Henchmen attempts to assault nob mob, overwatch results in two hits and ditto wounds, killing two! A seven is required to arrive, gaining only six thus failing charge. Casualties and end game results. 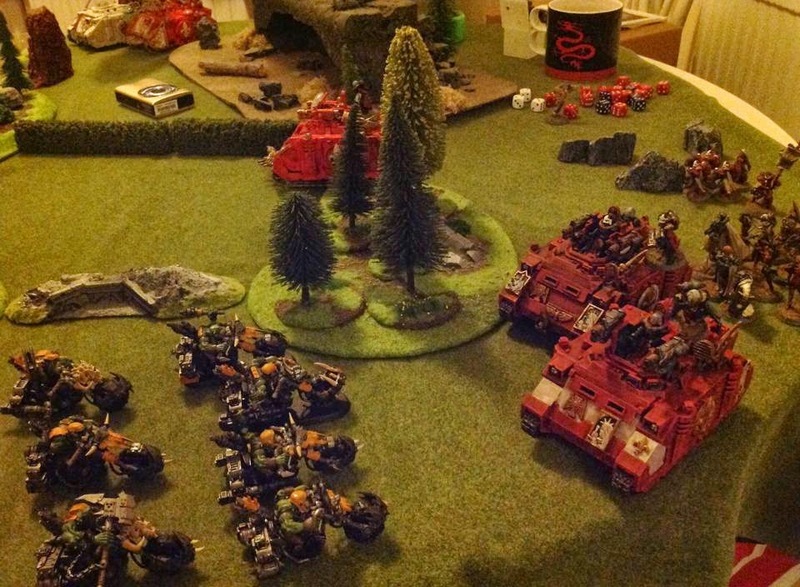 Ork casualties: ork boys in trukk dead, tank bustas 50%, trukks survive, big mek survive. Sister casualties: sister squad flamer heavy flamer boltgun dead, exorcist red survive, exorcist white dead, immolator melta survive, immolator melta dead, immolator flamer survive, repressor dead, avenger survive. 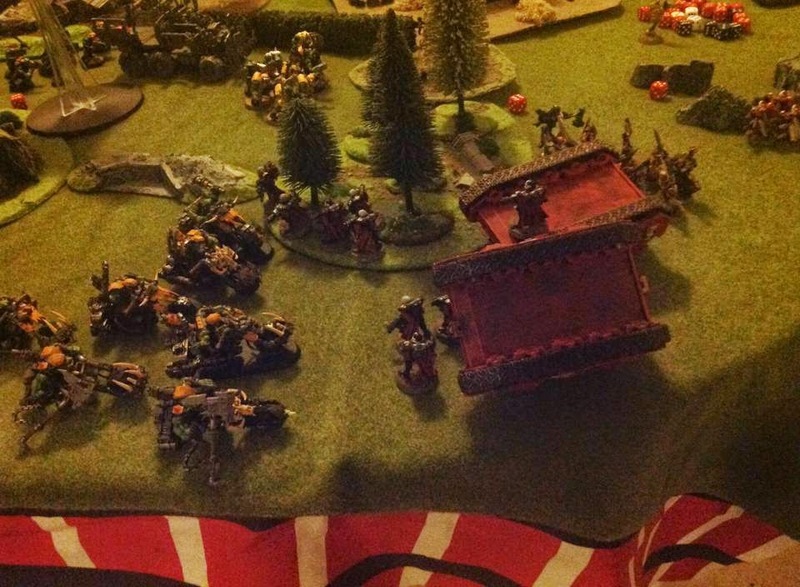 Partial casualties: Orks: Warbikers stay dead, rest are ok.
Sisters: Loyalty, Righteousness, Blades of Ire stay dead. Vengeance is ok.
And here are a bunch of pictures that I have no idea if they reflect the actual battle or not.